It has been great making sterling silver rings but I wanted to venture into making gold rings. To buy pure gold wire was way too expensive to start with. So I decided to find out where I could get gold filled wire. I surfed the internet and found Inspire With Wire. Unfortunately they only have a small range of gold filled wires. 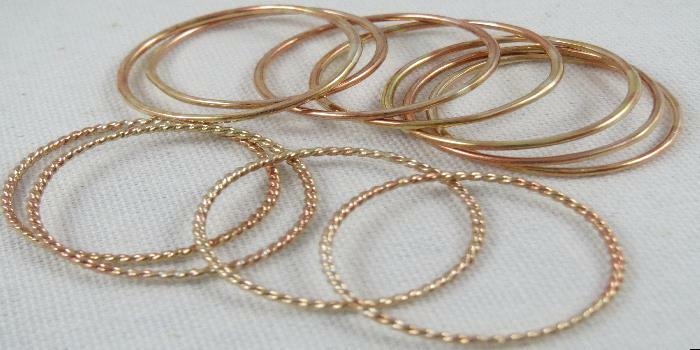 Anyway, I purchased some 18 & 16 gauge 14K yellow gold filled half hard round wire, 18 & 16 gauge 14K rose gold filled soft round wire and 18 gauge 14K yellow gold filled twisted wire from them. As I was unsure what to use as solder I did some research on the internet. Upon reading some articles on the subject I found that most people used gold solder for the gold filled wire. I purchased some 9ct gold solder sheet from Australian Jewellers Suppliers, they advised me this should work. The sheet was thick and a little hard to cut into pieces. So I had to hammer the sheet out to make it thinner. Then I could cut it into some tiny pieces. This 14k gold filled wire was quiet thin so I decided as my first project with this wire to make some stack able rings. Everything went well with the shaping and pickling. Now it was time to solder with the small gold solder pieces. I discovered that the pieces that I thought were small enough were still too big you really need the most minute pieces. How I realized this, was once I had finished soldering some of the rings had small blobs of gold on them. These rings were ones that I must have put too much solder on. This wasn’t the only problem, I also noticed that with the rose gold wire the gold solder showed as a different colour. This did not seem to stay once I sanded and polished these rings. Another problem with rings was they seemed to be patchy. I really didn’t know how to solve this one so back on the net and more research. The research seemed to suggest to use a very hot pickle with gold filled wire. So I heated up my pickle and put the gold filled wire rings in. I left it for about 20 minutes cleaned them up and put them in the tumbler for about 3 to 4 hours. They came out great all the patchiness had gone. You can see the patchiness on the rings on the photo above. It is called Pickle compound you can get it as 500 grams or 1 kG. I have a flex shaft and use the green habras bristle discs to give them a high polish.